Welcome to HWPA- North Campus - Gainesville! Please complete the following registration form. All fields with a red asterisk must be completed or the form will not submit. A Credit/Debit Card is require to submit your registration. Cash or Check tuition payments must be received before the 8th of each month. Cards on file will be ran on the 8th of each month. We Look Forward to Seeing You in the Spotlight! Tuition is due on the MONDAY of camp. As a convenience, all outstanding tuition will be cleared using the credit card on file. Students will be withdrawn from camp should a balance remain after the Monday of camp service. A credit card is required to remain on file. A returned check fee will be assessed to any account with a check returned. New students NOT currently enrolled with HWPA; $20.00, registration fee. Current HWPA students registration fee will be waived. A $20.00 deposit is required to register for camp. All deposits are NON-REFUNDABLE. Early Registration discounts may be used one time during the registration period. FLASH SALE: Register between March 25th - 29th and receive a $25.00 discount off 1 camp. A $20.00 deposit is required. Early Registration: Register by April 26th and receive a $20.00 discount off 1 camp. A $20.00 deposit is required. May Registration: Register between April 27th - May 17th and receive a $15.00 discount off 1 camp. A $20.00 deposit is required. Dancer's Workshop: Registration discounts are unavailalable on Dancer's Workshop. A Sibling discount is available to siblings attending the same week of camp. Pay full price for the 1st child. The 2nd child receives a $25.00 discount on the lesser priced camp. A third child and any additional children, enrolled in the same week of camp will receive a $50.00 discount. Sibling discounts are not available on Dancer's Workshop. As the legal parents or guardian, I release and hold harmless Heather Wayne's Performing Arts, Its owners and operators for any and all liability, claims demands, and causes of action whatsoever, arising out of or related to any loss, damage, or injury, including death, that may be sustained by the participant and/or the undersigned, while in or upon the premises or any premises under the control and supervision of Heather Wayne's Performing Arts, Its owner and operators or in route to or from any said premises. I understand and agree to the terms stated above. 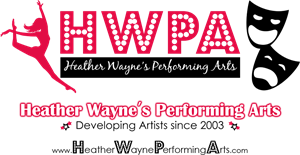 The undersigned gives permission to Heather Wayne's Performing Arts, its owners and operators to seek medical treatment for the participant in the event they are not able to reach parent or guardian. I hereby declare any physical/mental problems, restrictions, or condition and/or declared the participant to be in good physical and mental health. I understand and agree to the terms stated above. I give HWPA permission to use my child(s) picture for the purpose of advertising on the studio website, social media, and/or informational brochures. If for any reason I do not feel comfortable with this, a written notice to the school will endure my child's picture not to be used for any reason.